Temperature measurement using a thermocouple involves connecting the two thermocouple leads to a pair of instruNet Vin+ and Vin- input terminals. instruNet calculates the value of the temperature in degrees Celsius using a polynomial linearizing equation. It is recommended that you install an additional wire from the instruNet Vin- screw terminal to the instruNet GND screw terminal, at the instruNet hardware, as illustrated above, and as noted here. 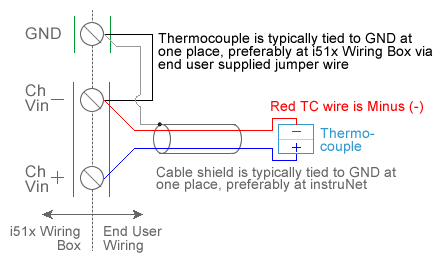 The RED wire within thermocouple cables often contains the negative (-) signal, which is the opposite of what one might expect. This is driven by the ANSI standard for thermocouples; however there are other standards with other color codings, as noted here. 1. Set the Sensor field in the Hardware settings area to the appropriate Thermocouple type (e.g. J, K, T, E, R, S). 2. Set the Wiring field in the Hardware settings area to Vin+ - Vin- (i.e. differential analog voltage measurement). 3. Set the Measurement Range in the Hardware settings area. For details, click here. 4. Wire your voltage source per the above figure. Click here if you need more guidance setting up the software, and click here if the measured value is not correct 5, 10. If your thermocouple leads are backwards, then the measured temperature will be shown as varying in the opposite direction from ambient (e.g. if the instruNet terminals are at 25°C, the thermocouple is at 35°C, and the leads are backwards, then instruNet will report 15°C.). If you want a detailed report on your setup, press the Sensor Report button in the Channel Setup dialog. 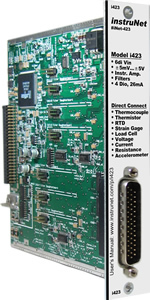 If your thermocouple is not working properly, please see Troubleshooting Thermocouples. Attaching the instruNet Vin- terminal to the Gnd terminal with a small wire solves many RFI problems, especially with the i100. Integrating for 0.001 to 0.01666 (or 0.020 seconds with 50Hz power) seconds solves many noise problems. The voltage across a thermocouple is a non-linear function of temperature at the thermocouple tip, as summarized below. 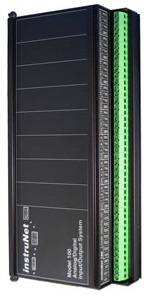 For details on what each product can do, see i420, i423, i430 and i60x. Errors within the thermocouple itself, which are often due to impurities in the thermocouple materials. For more information, please consult your thermocouple supplier. Cold Junction Compensation measurement and linearization error, which is typically < ±0.25C. Maximum thermocouple linearization software error: J: ±0.05C; K: ±0.08; T: ±0.05C; E: ±0.04C; R: ±0.03C; S: ±0.03C; B: ±0.04C; N: ±0.05C; C: ±0.5C; D: ±0.5C; G: ±0.67C for 0 to 300C, ±0.26C for 300 to 2315C. Thermocouple voltage measurement error (e.g. ±10uV maximum voltage measurement error with the i100 box on the ±10mV range with 0.001 seconds of integration).